Welcome to all my new followers, I hope to post regular updates of progress on this house. I have had it for a few years now and it has stayed untouched for many of them as I have been concentrating on my miniatures site. 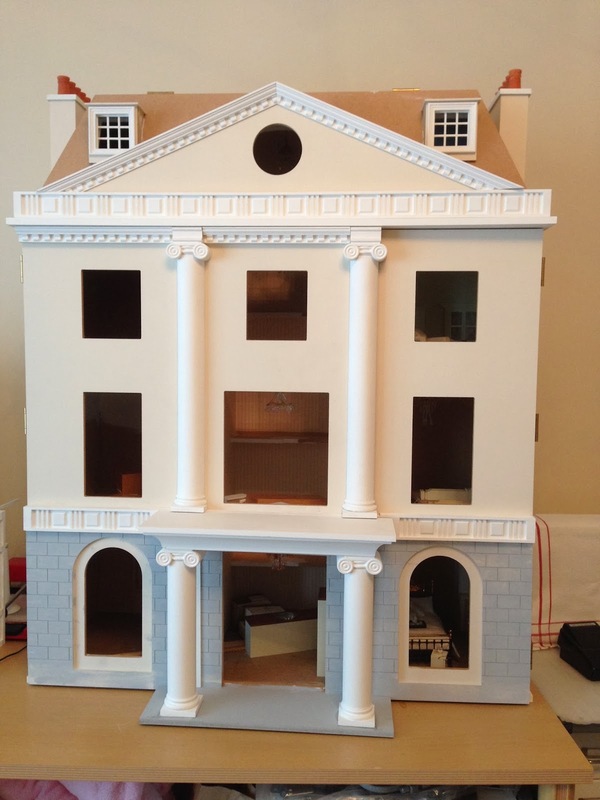 But..... now my fab husband, Bernie has stepped in to finish the building of it - the real time consuming stuff like painting the windows and adding all the details to the front facade. I have already put most of the electrics in and decorated 2 of the rooms but once Bernie has finished it I will try and get at least one room completely finished. Of course, I only want to put in everything I have made I don't really want to put any of the purchased pieces in that I have collected over many years. I really must get around to selling them on Ebay or something! Anyway here is the start of what Bernie has done - I will post updates when I feel there is enough changes to be noticed. Here Bernie has added the columns and some of the panel pieces, I had already got it painted on the top half but I want him to change the colour of this for me also ( I have a long list of what I want him to do - poor love ) but he did offer (I bet he is sorry now)! well it looks like Bernie has done a great job ! !